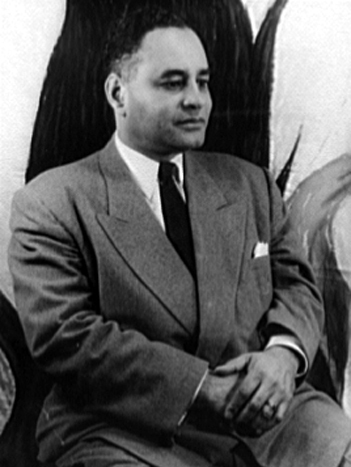 Ralph J. Bunche, political scientist and a founder of the United Nations (UN), was a key UN diplomat for more than two decades. In 1950 Dr. Bunche became the first African American to receive the Nobel Peace Prize. Earlier, while with the U.S. Department of State (1944-1946), he wrote the trusteeship portions of the UN Charter that address colonization. In 1948 he was appointed to a permanent post at the UN, where his outstanding skills as a negotiator could be most useful. He became undersecretary for special political affairs at the UN in 1957; in 1968 he was appointed undersecretary general. Dr. Bunche was a recipient of the Presidential Medal of Freedom. Addison N. Scurlock was a prominent social photographer whose career began in the early 1900s, and spanned more than six decades. His Washington, D.C. studio was a center for documenting the intellectual and cultural life of African Americans in the nation’s capital. His camera focused on educators, artists, scientists, musicians, politicians, and, of course, on the general populace.